Until I come, devote yourself to the public reading of Scripture, to preaching and to teaching. Do not neglect your gift, which was given you through prophecy when the body of elders laid their hands on you. Matthew 25 is famous for the sheep and the goats parable. 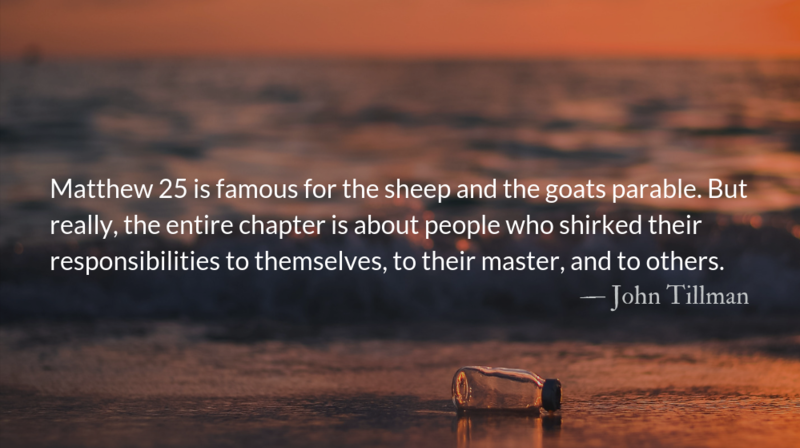 But really, the entire chapter is about people who shirked their responsibilities to themselves, to their master, and to others. The foolish virgins, the wicked servant, and the goats are a trinity of spiritual neglect. Pray this weekend through the three stories. Ask the Holy Spirit to show you warning signs if you are following the path of one of these neglectful souls. We need not stumble into extravagant sin to endanger our relationship with you, Lord. The virgins excluded from the banquet were not lascivious, or lustful. They were not greedy or cruel. They simply were irresponsible and unthoughtful. May we never fall into the dim thoughtlessness of complacency, and may we regularly refresh ourselves with the oil of your Holy Spirit to brighten our lamps when called on. We need not squander your blessings to use them unworthily, oh Lord. The servant given one bag of gold didn’t lose it, or gamble it away. He didn’t try to steal it. He just didn’t try to use it. The servant failed to understand, and so do we, that the king wasn’t investing his money with people. He was investing in people with his money. The king expected growth in the servant. Growth of the gold would only be a side effect. He would have found more mercy in the master had he tried and failed, than in failing to even try. May we dare to step out with whatever seemingly insignificant gift he has given us. You, oh Lord, do not despise small beginnings or small gifts well and truly used in faith. We need not be ignorant of you, Lord, to miss heaven. We need only be uninvolved and unconcerned for others. The goats didn’t actively cause hunger, or thirst, or homelessness, or refugees. They didn’t cause nakedness, or crime, or unjust punishment, or oppression, or sickness. They just didn’t do anything about it. This was enough to show that Christ had no place in their lives and they had no place with Christ in his eternal life. Dwell with the Holy Spirit this weekend, asking him to enlighten you about areas in which you may be prone to following in the missteps of the virgins, the servant, or the goats. We are responsible for the care of our communities, spiritually and physically. This requires a financial and a spiritual harvest. We too often, like Jonah, feel responsible that those who have wronged us should not “get away with it.” But in God’s timing, nothing goes unpunished.